Jacqueline Sheehan’s Book, Picture This, A Favorite Read of The New Barker. Picture This by Jacqueline Sheehan is the third book read and reviewed by The New Barker. We enjoyed it just as much as her first bestseller, Lost & Found, one of our all-time favorite books. The second book we reviewed by Sheehan, Now & Then, is the story of a remarkable journey involving one big dog, Madigan, an Irish Wolfhound, and a wonderful cast of characters. 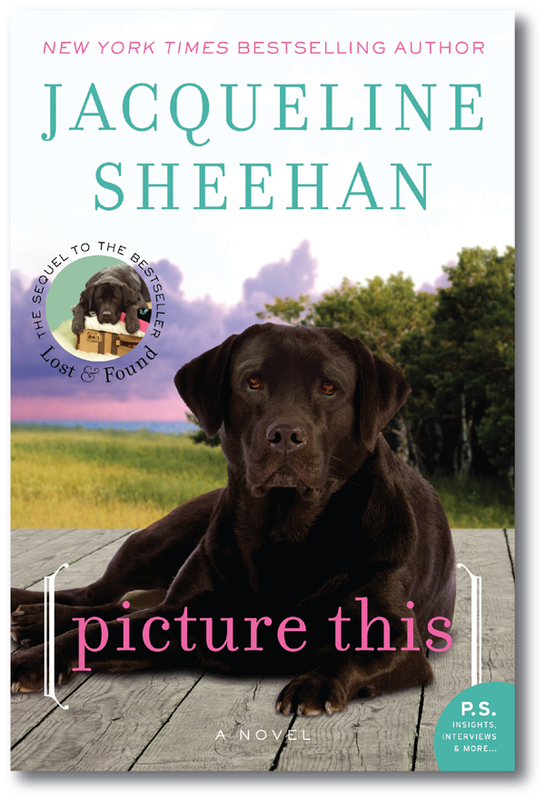 Picture This, by Jacqueline Sheehan, a favorite read by staff of The New Barker. Picture This is actually the sequel to her bestseller, Lost & Found. But you needn’t read Lost & Found (which has been optioned for film by the actress Katherine Heigl) to enjoy Sheehan’s latest book. Like the two previous books we reviewed, Sheehan writes about love, heartbreak, inner strength and the courage to restore and rebuild. Rocky Pellegrino, the book’s heroine, lives on an idyllic spot, Peaks Island just off the coast of southern Maine. She works at what seems to be the perfect job for her, as the animal control warden. As with the storylines in her first two books, this one is a mystery, with several plots that will eventually lead to an amazing ending. Sheehan’s training in psychology is certainly integral to her writing, especially in understanding motivation, she says, which is at the core of character development. Her descriptions of people, animals, Peaks Island and even the houses, are as alive and robust as if watching them unfold on stage. Yes, dogs remind us of the importance of living in the now, not only for our health and well-being, but to keep an eye out for what might be waiting for us – good or bad. By not focusing on the moment, what things could we possibly be overlooking? Rocky is a cool, tough woman on the outside. She seems to have contentedly settled into a comfortable life, while still recovering from the sudden death of her husband, Bob some time ago. A bit guarded when it comes to love, she opens up to it, only to be hurt once again. She throws herself into renovating an old house, which to her seems haunted bittersweetly by lost love and forgotten secrets. The house speaks to her soul, and it’s fun to discover those secrets while we live vicariously through Rocky, and the home’s renovations. Then, a mysterious phone call from a young woman looking for her biological father, throws the story in to full mystery gear. Bob was Rocky’s soulmate, her true love. Could the girl possibly be Bob’s long-lost daughter? Could this be the connection Rocky has longed for, maybe even a message from Bob himself? The women in Sheehan’s books are all vulnerable, but tough. They live life as it comes, and fall hard in love. Luckily, they have a dog who is forever their protector, and the one constant in all of their lives. 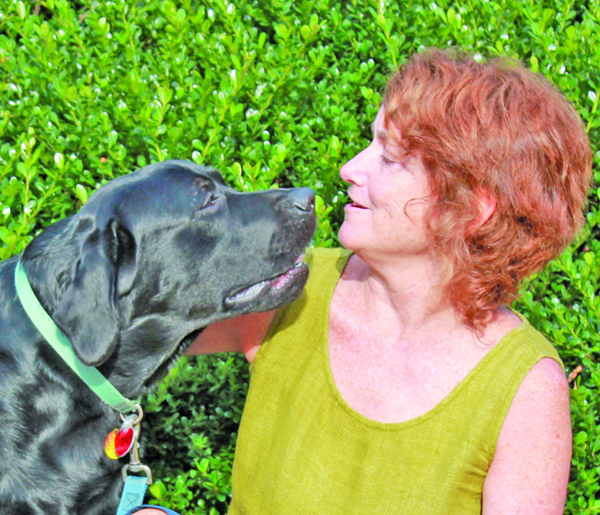 Jacqueline poses with Captain, the day he auditioned for the role of Cooper in a promotional video for the book, Picture This. Special Note: Jacqueline Sheehan was also recently featured in The New York Times Sunday column, Modern Love. Read, Though Now Apart, We Faced a Common Enemy. Another poignant piece of writing. The New Barker is Florida’s top dog lifestyle magazine. To subscribe, visit www.thenewbarker.com. A one year subscription is only $16/four issues, mailed to you (or your dog). Previous Previous post: Dog Lovers Around the World Agree: That’s One for Pope Francis.